mission: use my homemade kimchi. i omitted the scallion (didn’t have) and tofu (didn’t have enough space in my puny mixing bowl and felt it was unnecessary flavor wise; i’d use it for more protein/staying power though). it was really interesting (i mean, ofc it is; have you ever thought about kimchi quinoa salad before? ), and good to get me out of my mediterranean quinoa salad rut. even my skeptical parents were into it. the batch was gone in 2 days, so that should say something. 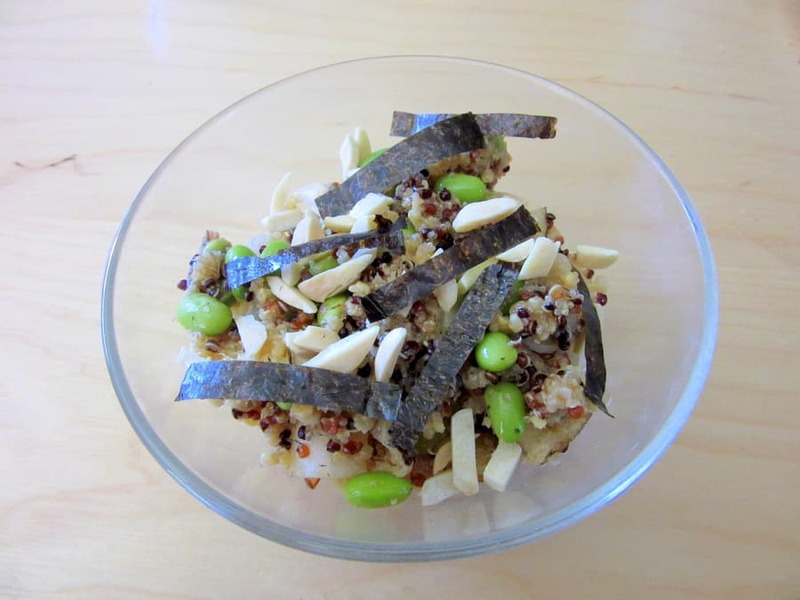 the seaweed added brininess, the pear a sweet crisp fresh element. the almonds contributed crunch and a bit of richness. i was super impatient so the kimchi had only fermented for a day before i used it in this, so it was pretty fresh tasting with only a little fermenty/pickly vibe going on. it was perfect for me. the ginger added another area of spiciness that the kimchi didn’t cover. i thought the edamame was useless flavor/texture wise, but it did add color and protein. Combine all the salad ingredients except for the nori. Combine the vinaigrette ingredients separately, then add to the salad and toss to coat. Garnish with the nori.